On June 5, 1989, the city of Beijing, wearied from weeks of unrest, desperately needed a dose of hope. When it arrived in the form of a slender, unarmed man staring down a column of military tanks, observers could not believe their eyes. Waiting for this man's defiance to get him killed, the photographers wily enough to elude the government's detection fixed their lenses on "Tank Man" and helped record a moment that forever defined the world's view of Chinese oppression and fueled uprisings against similarly stifling regimes around the world. Jeff Widener recalls snaking his camera around the corner of a hotel balcony, bullet holes above his head, to snap what's widely regarded as the iconic image of the event. Widener also remembers his famous photo nearly never happened. "I almost blew it," he said. Listening to him retell his story, it would have been understandable if he had. The night before, violent clashes between the People's Liberation Army and pro-democracy protesters in and around Tiananmen Square ended with thousands of unarmed student demonstrators killed or wounded after the military opened fire. For Widener, it ended with his camera literally saving his life twice and a concussion. Caught between an angry mob bent on killing a soldier, he feared he was next. Instead, the group's leader shouted "You photo, you photo," Widener said, urging him to chronicle the violence. Spared from death, Widener set to work. One problem: his camera was taking forever to reset between pictures. "I saw a man on fire. I'm looking at him and I can't take a picture," he said. Finally ready to snap evidence of the bloody showdown, Widener raised his camera, then, "Bam," he said, smacking his palms together. A rock headed straight for his face smashed his camera instead. Dizzy from the impact, Widener staggered away to shoot another day. The next morning, sunlight replaced the fiery explosions. Told by his editors at The Associated Press to head back toward Tiananmen Square, Widener cycled the few miles from the office over to the Beijing Hotel where he found the lobby swarming with soldiers. He buried his Nikon FE2 inside his jean jacket, spotted a fellow Westerner and convinced him to pretend they were friends so he could take photos from a balcony overlooking Chang'an Boulevard. Twenty years later, Widener still has no idea who the man is, saying only he was an American teaching English in China named "Kirk or Kurt." "I hope he's still alive," Widener said lightly gripping a drink during a recent visit to New York. "I owe him a beer, maybe two." Once Widener was set up in the man's sixth-floor room, he realized he had no film. Unwilling to risk going back out among the soldiers, Widener asked the man if he could go scrounge for film. "Get me anything," he told him. A couple agonizing hours later, the teacher returned with one roll of Fuji 100 (Widener normally used 800 speed film). Around the same time, Widener noticed a parade of tanks rolling toward the square, the latest message to the bloodied and battered protesters that the Communist regime was in charge. He loaded his camera and headed to the balcony. As he angled himself so he could point the camera around a corner to face the action, Widener saw a man standing in front of the tanks. His first thought: "Damn, this guy is going to screw up my picture." His next thought: Ten feet away his telephoto lens lay on the bed. "I'm a gambler and I ran for it," he said. Lens assembled, Widener took aim, his camera again slow to reset. Soon after, the man was quickly whisked away from the street. "All I had was three shots. One came out." With his lone roll kicked, the teacher offered to take the film back to Widener's editors. Kirk or Kurt put the roll in his underwear and left. Widener stayed and rode out the tumultuous night eating cheeseburgers and nursing his pounding head. The next day, among the several photos capturing "Tank Man," Widener's appeared on front pages worldwide. "My picture's the only one with lamps," he said. 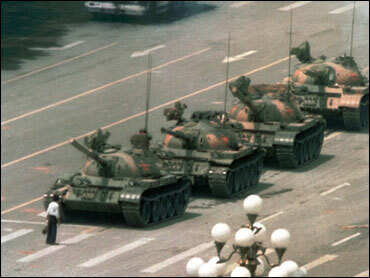 Images of "Tank Man" are still banned in China. Widener, left, with fellow AP photographer Liu Heung Shing in 1989, just before the crackdown. In a career that has spanned four decades, Widener, 52, has been dubbed arrogant and hard to work with, charges that don't seem to faze him. He also wants to be known for more than just his famous moment in Beijing. (His Web site's home page bears the title "beyond Tiananmen." "I'm a die-hard photojournalist," he said. A finalist for the Pulitzer Prize in 1990, Widener, who grew up outside Los Angeles, spent several years as AP's Southeast Asia photo editor, his work taking him to the world's remote corners as well as the rope lines for the British royal family. Since 1997, Widener has worked for the Honolulu Advertiser, a gig he's not in love with but seeks to make worthwhile by exploring the island's darker, less appealing slices of life for a book he describes as "the opposite of everyone's perception of paradise." Despite admitting an insecurity over his work, and being a lifelong sufferer of "Charlie Brown syndrome," Widener said he always knew he'd snap a famous photograph. Today, the "Tank Man" picture serves as a historical flash card, instantly reminding the viewer of the time, place and event. "I don't know how I would have handled losing the image," he said. "It would have been really tough on me." From time to time, Widener thinks about the brave man forever encapsulated in his photo. "He was one seriously pissed off guy. He just had enough," Widener said. He thinks sometimes of himself as a coward - he escaped death while his subjects were massacred. "We took pictures that put protesters in danger," he said. He hopes that ultimately, the deceased approved of his work.